Those who manage a restaurant or bar know how important small accessories like bottle openers and custom swizzle sticks can be when catering to a crowd. While supplying attendees with their drinkware essentials, take advantage of an easy opportunity to promote your business name with an assist from ePromos. Get repeated brand exposure by advertising your company with handy gadgets that you can gift at industry trade shows and other public events. These inexpensive solutions are sure to go a long way with employees, potential customers and business partners! Securely hold your favorite beverage when you are on-the-go with this Braided Cord Custom Drinkware Handle! 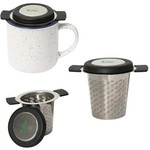 This Stainless Steel Promotional Tea Infuser is the perfect gift for anyone that enjoys tea! The mesh filter contains even the smallest tea leaves. It's perfect for making either a cup of tea, or an entire pot! Protect your hands from your hot beverages with this high-end Traverse Leather Custom Cup Sleeve. It's made of durable full grain leather, and will be sure to impress clients and employees alike! Tote your favorite six pack of craft beer or soda in style by securing them inside this unique wooden Bullware six pack bottle custom carrier imprinted with your logo. The perfect item for distilleries, corporate parties and more! Keep beverages chilled without watering them down with this Bullware Custom Beverage Cubes Set! Add your imprint to tin packaging. Easily carry two bottles of wine, or a growler of craft beer to the party with this Bullware Wine & Growler Custom Tote! It's made of high-end durahyde. and is debossed with your logo. Lighten up your next corporate event with these promotional ice cubes featuring your imprinted logo. Break the ice at your next event with these light-up promotional ice cubes that are liquid activated and feature your imprinted logo! Lighten up your next event with these promotional ice cubes featuring your imprinted logo. When promoting your restaurant or bar and grill, bar promotional items are a subtle way to advertise your brand. This is only one of the reasons your marketing plan should include a budget line for drinkware accessories. You can't go wrong with custom barware including old favorites and the hottest new types of accessories including cup sleeves, six pack bottle carriers and more. And, more importantly, these accessories add convenience to your customer’s life. Avid hosts and hostesses will appreciate using high-quality products such as custom drink stirrers, bar tools, bottle caps and freezable wine bottle insulators. In addition, customers always appreciate an element of amusement, and you spread the fun with color-changing ice cubes and a light-up shaker bottle. Your options for exceptional-quality gifts and giveaways are endless. Browse a host of styles and pick your preference from a variety of shapes, sizes, colors, functions and features including custom stir sticks, water bottle lanyards, stir sticks, snack and wine trays and beverage cubes. You’ll find attractive and budget-friendly options backed by our 110% guarantee. Brighten spirits and increase brand loyalty with the gift that keeps on giving! Our personalized drinkware accessories are all created with superior quality products including stainless steel, durable acrylic, flexible silicone, wood, shatter-proof plastic, full-grain leather and more. We have the ability to custom engrave, screen print, pad print, deboss or print in full color on these versatile pieces with nearly any design! Order your custom drinkware accessories today from one of our talented Brand Consultants. They are experts at customer service and ready to help you. They’ll even walk you through your order from start to finish, which is definitely a reason for “cheers”!